I have often pondered the origin of my interest in history. While I can’t pinpoint a moment, I can identify a place that greatly contributed to my history inspiration. This place like few others in America has the power to foster a fascination for history: the restored colonial capital of Virginia, Williamsburg. Turning off interstate 64 heading east from Richmond, a traveler passes through old growth forests edging tidal creeks. Tucked away in Virginia’s tidewater region is America’s largest outdoor history museum, a restored town brought to life every day of the year by hundreds of costumed interpreters who face the daunting challenge of transporting visitors back in time to the eighteenth century when America declared her independence from Great Britain. The restoration of the town began in 1926 through the generosity of millionaire John D. Rockefeller Jr., whose money transformed the faded, sleepy Southern town into a jewel of historic preservation. Today “Colonial Williamsburg,” the popular name of the restoration and foundation that runs it, exemplifies history immersion. If the easiest way to learn a language is immersion, surrounding oneself with native speakers, then perhaps the same could be said of history. Colonial Williamsburg douses its visitors in the sights, sounds, smells, tastes and feel of life in the 1770s. Walking the Williamsburg streets seems the equivalent of entering a foreign country. At once the visitor grabs on to the familiar while engulfed in a sea of the unfamiliar. From the clip-clop of horse-drawn carriages to the shrill sound of fifes and the boom of cannons, the sounds of long-ago life assault the ears. Intricately carved wood paneling, neatly clipped boxwoods, unusual brick patterns, gunsmoke, gingerbread, ink, wood, leather, horse dung, peanut soup—all blend together into a feast for the senses. Into this alternate universe walked a ten-year old boy who has not been the same since. Several decades ago, I stood transfixed by this captivating world. The colonial music teacher demonstrated an eighteenth-century hunting horn for me, a budding French horn player. I marveled at the sight of food prepared on an open spit. The far off sounds of the fife and drum corps called me to watch their procession down the street, my excitement building as boys my own age marched out of a distant time past. A recent walk around the historic city brought back layers of memories. I worked there for one brief summer as a graduate intern and have enjoyed numerous visits over the years. Without getting too nostalgic or philosophical, let me say that I think we need places like Williamsburg to offer us a chance to reflect on where we’ve come as a nation and how time transforms both the environment and culture. 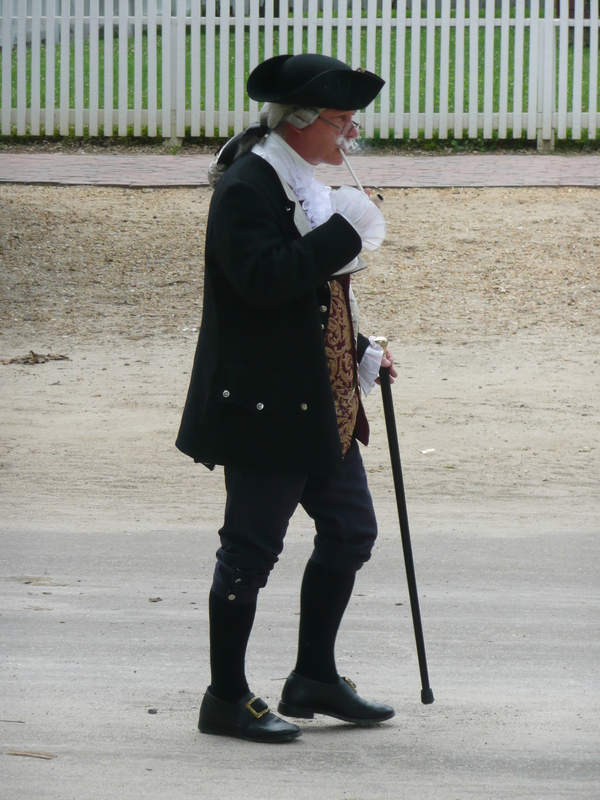 Colonial Williamsburg’s motto is “that the future may learn from the past.” That motto never goes out of date. This entry was posted in 18th century, American Revolution, city/town and tagged colonial, VA, Williamsburg. Bookmark the permalink. Good memories. When I first visited Williamsburg as a college kid from California, I was stunned. I just couldn’t believe that such a place existed. One correction: The forests in Eastern Virginia are not old growth! good post, once again. thank you. happy 4th to you!